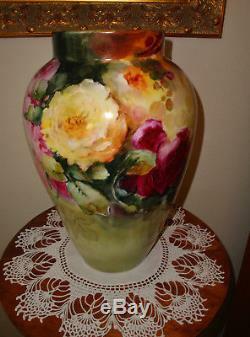 Spectacular Big and Bold Antique Large Limoges France vase with roses. 9" across with a 28" diameter. Looks much like the work of Bischoff or Aulich.. Sadly can't find a signature.. Marked with the D&C France mark which dates it from 1891. Condition is excellent with only a few flecks along the rim.. Please feel free to ask any questions you may have. MORE PICTURES AND LAYAWAY IS AVAILABLE THROUGH OUR Rubylane SHOP. The item "Large Antique Limoges France Hand Painted Porcelain French Vase Roses Ca. 1891" is in sale since Monday, July 23, 2018. This item is in the category "Pottery & Glass\Pottery & China\China & Dinnerware\Limoges". The seller is "theverybestma" and is located in Venice, Florida. This item can be shipped to United States, all countries in Europe, all countries in continental Asia, Canada, Australia.